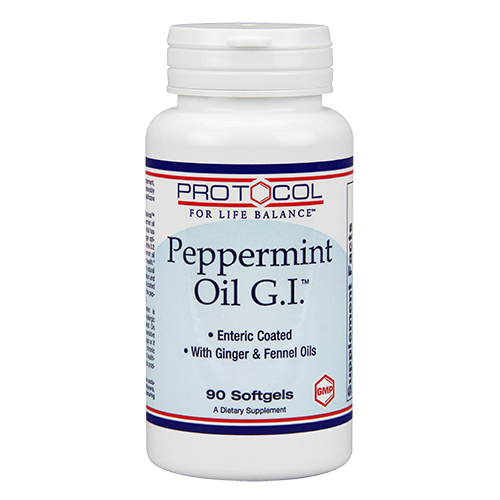 Peppermint Oil G.I. by Protocol for Life Balance is formulated with fennel and ginger oil too. Advertências: Keep out of reach of children. Do not take more than recommended dosage. Consult your healthcare provider before starting this or any other dietary supplement. Peppermint is generally regarded as being safe in non-allergic adults when taken in small doses as directed. Do not use during pregnancy or lactation, if sensitive to the mint family, taking prescription drugs or if suffering from gallbladder problems or chronic heartburn except as advised by a qualified healthcare provider. Notas: Contains no sugar, salt, starch, yeast, wheat, gluten, corn, milk, egg, shellfish or preservatives. Recomendações de uso: As an herbal dietary supplement, take 1 softgel 1 to 3 times daily, preferably between meals.